WHO CAN PARTICIPATE IN CPDI AFRICA PROJECTS ? The CPDI Africa competition is open to practitioners and students of architecture and all related professions of the built environment, inclusive of arts & design, engineering and town planning and urban design. HOW MANY DESIGN CATEGORIES ARE THERE IN THE CPDI AFRICA 2017 COMPETITION? There are 2 (two) main categories for CPDI Africa 2017: The New African Home (category one) and The African Iconic Design (category two). Both are eligible to win cash prizes, exhibition exposure and publication features. WHAT ARE THE CASH PRIZES FOR EACH CATEGORY? Both categories offer similar Cash Prizes per wining position: 1st Place wins $3, 000.00. 2nd Place wins $1,500.00 and the 3rd Place wins $500.00. Funds are paid in either USD or in the Local Currency of the Winners country of residence. MAY I WORK WITH TEAM MEMBERS ON MY CPDI PROJECT ? HOW MANY MEMBERS CAN BE ON A TEAM ? Teams are limited to a maximum of 3 members. If participating as a member of a team, the architect / student architect will serve as Team Lead. ARE ALL TEAM MEMBERS REQUIRED TO PAY THE REGISTRATION FEE ? Yes, all members who wish to be recognized for their participation in CPDI Africa projects if there submission should win, should register and pay their registration fee. Each team will only win one prize amount if chosen as a winner, and so team members should have a standing agreement for themselves regards the sharing of the prize funds. WILL PROOF OF MY ACADEMIC OR PROFESSIONAL BACKGROUND BE REQUIRED OF ME ? Practicing architects or architecture students must provide valid information of their credentials, college, university, polytechnic or other, during the Jury selection phase of the competition. Allied students or professionals will also be required same. Uploading Resumes or CV’s are part of the submission requirements. ARE OUR PROTOTYPE DESIGNS LIMITED TO SPECIFIC AFRICAN INSPIRATION OR ETHNIC IDENTITY ? There will be multiples of styles and ‘identity’ in the African architecture created, as Africa boasts of hundreds of cultures and Ethnic Groups. In order to stay ‘true’ to location and identity, you are encouraged to draw inspiration for your design from one single Ethnic Grroup. A blending of cultures, identity or aesthetics, will however will not be disqualified. Designs that are submitted that are obvious copies of existing built buildings will be disqualified. IS PARTICIPATION IN CPDI AFRICA PROJECTS LIMITED TO ONLY AFRICANS ? CPDI Africa is open to participants from all of the world, and does not discriminate by race, creed, ethnicity or religion. Participants are encouraged to build multicultural / multinational teams in order to harness a multiplicity of creative ideas. Yes. You may submit more than one entry, but each entry requires its own identification, registration and fee payment. Once again, all entries are acceptable without fee payments, but only those with fee payments are eligible for the cash prize. ARE THERE WAIVER AGREEMENTS FOR OUR SUBMISSIONS ? By submitting entries into the competition, participants grant CPDI Africa full rights to utilize their works in the various ways articulated in the Waivers & Agreement section of the Design Brief. 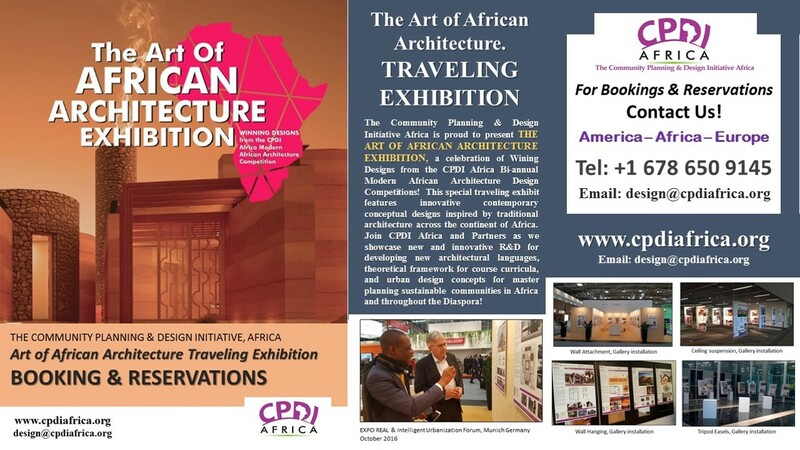 CPDI Africa uses submitted works to promote and develop modern African architecture, while providing recognition and potential employment for participants. A full understanding of the waiver tenets must be understood before any submission is made to the project. SUBMISSION GUIDELINES FOR THE CPDI AFRICA 2017 ARCHITECTURE COMPETITION WILL BE UPLOADED MAY 31st, 2017. ARE THERE OTHER OPPORTUNITIES TO PARTICIPATE IN CPDI AFRICA PROJECTS? Yes. The CPDI Africa Design Competition is an Annual Competition, which renews each year on January 1st. There are also opportunities to do internships, workshops and other exciting engagements with CPDI Africa projects. One of the most engaging opportunities for participants, is to earn fees during the project development phase, if their design is purchased by a CPDI Africa Client. Always check cpdiafrica.org and facebook.com/cpdiafrica for upcoming opportunities.